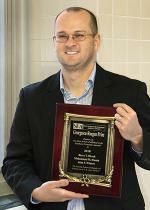 John V. Winters, associate professor, was awarded the Georgescu-Roegen Prize in Economics 2018 Runner-Up for his article titled The Puzzling Pattern of Multiple Job Holdings across U.S. Labor Markets. Southern Economic Journal 84(1): 26-51. Winters coauthored the paper with Barry Hirsch and Muhammad Husain. On Dec. 3, 2018, Jeri Prescott presented the James R. Prescott Scholarship in Economics to graduate students at a reception in Heady Hall. See the photos. Alejandro Plastina, assistant professor, was interviewed on RFD-TV about the Cover Crops Net Returns Calculator. Ag Business was well represented Nov. 28 at the CALS Student Council's last meeting of the year. 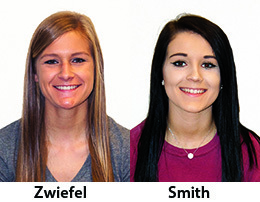 Council members elected officers for 2019, including Ag Bus junior Megan Zwiefel, who was elected vice president, and Ag Bus sophomore Elizabeth Smith, who was voted the new treasurer. 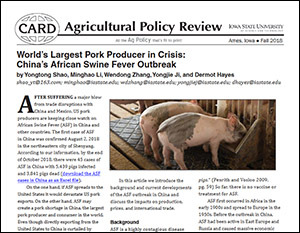 The Fall 2018 edition of the Center for Agricultural and Rural Development's (CARD) Agricultural Policy Review is now available. Ag Bus senior Gary Wynne was elected to the Cardinal Court for Iowa State's 2018 Homecoming. He and the rest of the selected Homecoming Royalty were announced at the Homecoming Pep Rally Friday, Oct. 26, 2018. The Washington Center for Equitable Growth supports social science research investigating whether and how inequality affects economic growth. We are currently requesting proposals in the areas of macroeconomic policy, market structure, human capital, and the labor market. The full request and more information on our grantmaking can be found on our website (https://equitablegrowth.org/engage/apply-for-a-grant/). 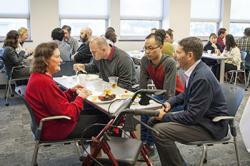 The department's annual holiday celebration was held from noon to 2 pm, Tuesday, Nov. 27, 2018, in 368A Heady. Plenty of tasty food catered by HyVee welcomed faculty, staff, graduate students and retired faculty, and a merry time was had by all. Alejandro Plastina, assistant professor, had the article "Choosing Corn Hybrids for 2019" published in Wallaces Farmer Nov. 26, 2018. Dermot Hayes, professor, and Chad Hart, associate professor, were interviewed for a Nov. 25th Des Moines Register story "Dozens of Iowa Farmers Get Less Than $25 from Trump Tariff Assistance, Data Show." Oleksandr Zhylyevskyy, associate professor, presented the paper "Causal Effects of Mental Health Conditions on Food Insecurity and the Role of SNAP" at the Missouri Valley Economic Association's annual conference in Memphis, Tennessee, Nov. 1-3, 2018. Chad Hart, associate professor, and Lee Schulz, associate professor, were quoted in the Nov. 21 Successful Farming article "10 Predictions for Farmers in 2019." Kevin Kimle, senior lecturer, presented “Innovation in Agriculture” at the Cultivate Conference at Fargo, North Dakota, Nov. 15, 2018. Mark A. Edelman, professor and Community Vitality Center Director, presented "Selected Gaps and Strategies for Addressing Equity for Rural Ventures" as Moderator for a Panel Discussion on "Innovation and Entrepreneurship" at the Rural Capital Forum Lenders Summit, organized by the Rural Opportunity Initiative collaboration at Georgetown University, Washington D.C., Nov. 15, 2018. Peter Orazem, professor, was interviewed by Jeff Angelo for the story "Why Are Iowa Workers Being Laid Off In A Hot Economy?" on WHO News Radio Nov. 16, 2018. Joseph McPhail ('08 M.S. 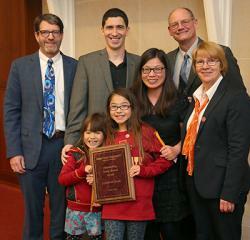 economics) was awarded the 2018 Iowa State University Economics Department Outstanding Young Alumni Award at the LAS Honors and Awards Ceremony at the the Iowa State University Alumni Center Oct. 25. Ebby Luvaga, senior lecturer, was featured in the the CALS "Spirit of Thanksgiving" video. Lee Schulz, associate professor, was part of a delegation of Iowa pork producers and industry officials who traveled to Korea after spending several days in Japan on what’s being called a “meat mission.” Schulz was quoted in a Radio Iowa story Nov. 16, 2018. Kim, Hyunseok and GianCarlo Moschini, “The Dynamics of Supply: U.S. Corn and Soybeans in the Biofuel Era.” Land Economics 94(4)(November 2018): 593-613. Gabriel Lade, assistant professor, presented at the MIT Center for Energy and Environmental Policy Research workshop Nov. 15, 2018.